More than 10,000 websites use Facebook Connect, a service that lets Facebook users log in to affiliated sites using their Facebook account and share information from those sites with their Facebook friends. About 30 million Facebook members access it through mobile devices. Twitter users spend 66% more dollars on the Internet than non-Twitter users, says market researcher ComScore. LinkedIn has more than 365,000 company profiles. More than 12 million small-business professionals are members of LinkedIn. More than 1 million small businesses and individuals promote their goods and services on MySpace. As smartphones such as iPhone and BlackBerry take off, more people are updating their Facebook and Twitter profiles while on the move. Smartphone shipments are expected to surge to 164 million this year, up 13% from 2008, says market researcher Forward Concepts. The mobile social-networking industry is expected to become a $3.3 billion market worldwide by 2013, ABI Research predicts. 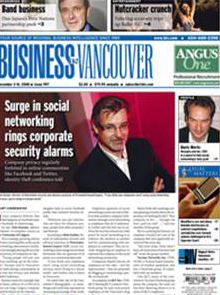 I was interviewed for a cover article that appeared in this week’s edition of Business In Vancouver. The story reads “Surge in Social Networking Rings Corporate Security Alarms” and talks about the rising use of platforms such as Facebook and the potential negative affects it could have on the workplace. Privacy and security are increasing concerns as more people congregate, share and communicate online. I don’t disagree, particularly when it’s employees of companies disclosing corporate information not intended for the public on a ‘company Facebook page’. This is particularly true with publicly traded companies. The same careful administration bestowed to a company website, should also be taken with a Facebook page or Ning community site or Myspace space. But this shouldn’t stop your company from embracing these social media tools and platforms, which allow you to reach prospects and customers in a meaningful and massive way like no other. First, you’re reaching them where they go and on their terms. At Facebook, a user will only get updates on your company if they opt-in by becoming a fan. At Twitter, a user will only receive your messages if they become a follower. They also have the power to share it with their friends, fans and followers instantly, giving you some viral love in return. While a company may not be able to control negative comments that are posted on the Internet, the web’s interactivity allows companies to respond to them. “There’s a whole etiquette to social networking that not everybody gets,” said Rajan Sodhi, vice-president of marketing at PEER 1 Network Enterprises Inc. (TSX: PIX). One consistent rule is to communicate openly, honestly and often. Vancouver-based PEER 1 uses a number of social networking tools and has an employee whose sole role is to cultivate the company’s online presence. PEER 1 also monitors the Internet for content that mentions the company. “It can be positive or negative,” said Sodhi. “If it’s something [about PEER 1] they aren’t happy with, we acknowledge them right then and there.” As well as reacting publicly on a blog or network on which a negative comment was posted, PEER 1 will usually follow-up with a phone call. I get a lot of emails asking me to post, discuss or review a service and rarely have I found one worth sharing. This is one of those rare moments. Sam Cabal asked me to take a look at his free search engine optimization (SEO) tool called reviewmyweb.com that provides a fairly detailed report of how well your website ranks against your competition. Simply submit your website URL, along with up to two of your competitors, and within minutes a report is emailed back to you. It takes into account Google page ranks, backlinks coverage, site content, and blog coverage. I just tried it and found it very impressive. So much so, I’ve just sent a copy of my report to my Senior Web Developer as we’re in the midst of optimizing our new PEER 1 website which went live a few days ago. This is a handy tool for web marketers that I encourage you to try out… and the price is right. Sam, thanks for sharing and good luck. In past posts, I’ve profiled some of the online video work we’ve been doing at PEER 1 to promote the company’s web hosting services. A press release went out yesterday to announce that two of our videos, Growing Pains and Plentyoffish.com Customer Story received four Telly Awards for originality and creativity. We’ve had a lot of fun putting these videos together and it’s nice to see them get some recognition. Special thanks go out to Talkie21 Studios and OnDemand Production for their excellent work on these projects. I studied their products and services, their corporate websites, but the real studying was done by reading their blog posts. 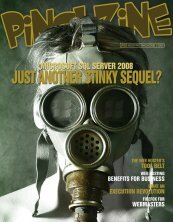 Three of my personal favorite blogs belong to PEER 1, Mailtrust, and MailChimp, names you may already be familiar with if you pay attention to what’s going on in the hosting and software industries. Sodhi enjoys discussing ideas and concepts in marketing on his personal blog. However, blogs are able to do more than just communicate your personal thoughts on whatever interests you the most. For example, Pat Matthews, president of Mailtrust, a Rackspace company, said, “My blog has helped us generate business as well as recruit more effectively.” Matthews has been posting in his “Small Town, Big ideas” blog (patsweblog.com) for over 2.5 years. He believes potential customers and employees like to read about the company they are going to do business with or work for in the future. Matthews added, “My blog has made a big impact on both levels.” Sodhi and Matthews’ blogs are independent of their company’s websites and still help them build business. What happens when you fully integrate your blog within your corporate website? Want to find out how passionate your customers are about your most popular product? Take it off the menu. Welcome to the Burger King ‘Whopper Freakout’. Thanks Lance for sharing this. Another brilliant example of a video gone viral.